Wait—Kickboxing and Cardio Kickboxing Aren't the Same Thing? When it comes to cardio kickboxing, misconceptions are still common. You may be familiar with these scenarios: you’re hanging out with a friend for coffee and she mentions she’s trying a cardio kickboxing class. You laugh. “Why?” you ask. “Are you trying to fight or something?” Or maybe you’ve been eyeing that sign at your gym – “New Class Open! Come try Cardio Kickboxing today!” – with trepidation, wondering how long it’s going to be until you start seeing black eyes and bruises on your fellow gym-goers. On the flip side, if your goal is to learn a martial art, you may not want to sign up for that cardio kickboxing class just yet. If you’re new to martial arts or just getting back into serious exercise, it may be a good jumping-off point, but it won’t offer what you’re looking for long-term. Confused yet? 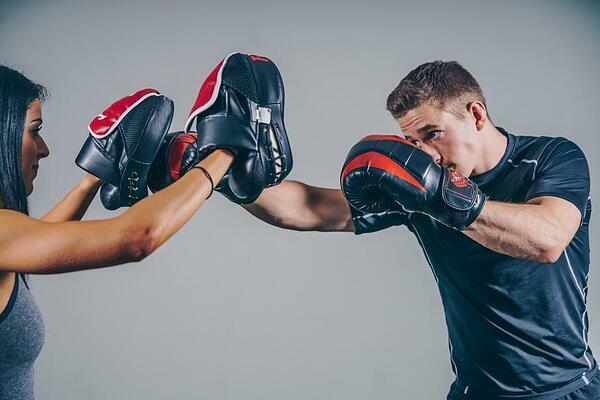 Here’s a quick breakdown of cardio kickboxing and kickboxing kickboxing that will explain exactly what you’ll get in each class. Okay, so what’s regular kickboxing? Kickboxing is a full-contact sport that grew out of martial arts and boxing. Its journey into mainstream sports began during the karate tournaments in the 1970's as a way to make scoring easier. Judges could easily tally the number of punches and kicks landed, without needing to know karate forms. Today, kickboxing is most closely associated with the Ultimate Fighting Championship (UFC) and mixed martial arts (MMA). So this is the class I take to fight people, right? If you want to! There’s no rule saying you have to take a kickboxing/muay thai/MMA/any kind of fight if you sign up, but you’ll probably at least end up sparring as part of training. Kickboxing places a heavy emphasis on proper technique. This often fosters a deep mind-body connection because of the focus and attention to detail it requires. Forging such a bond also relieves stress by calming the mind. In that respect, focused kickboxing practice is a lot like meditation—but with uppercuts. Most kickboxing classes are held at martial arts schools, not regular fitness gyms. You’ll learn techniques such as punching, kicking, blocking, counters, and footwork. You may work by striking heavy bags, or by working with a partner holding focus mitts or Thai pads. True, they both have cardio elements, but cardio kickboxing is just for cardio – not fighting, not self-defense, not nada but fitness. What’s cardio kickboxing class like? Cardio kickboxing classes are offered by many fitness gyms, and they usually combine full-body aerobic exercises with boxing and martial arts moves. Some classes incorporate equipment, too, such as punching bags. Classes don't include sparring with a partner, although in certain classes, you may still take turns holding targets for one. The best, and most popular, cardio kickboxing classes have participants strike freestanding bags. The focus of cardio kickboxing is twofold: movement and fun. There's little to no emphasis placed on technique, and the boxing and martial arts moves are kept simple. Most classes stick to jabs and crosses, for example, not uppercuts and hooks. While cardio kickboxing classes generally offer little to no resistance training, they do offer a tenacious whole-body workout, stimulate the mind, and build confidence. It totally depends on what you want to get out of the experience and what your goals are! 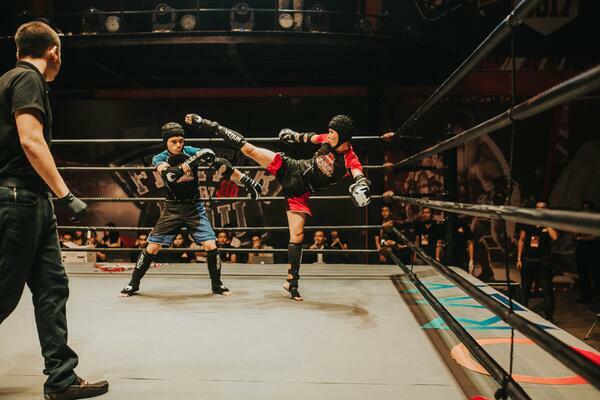 With kickboxing, the goal is to learn a series of skills and techniques, and (optionally) do sport combat at some point. With cardio kickboxing, the goal is to get your body moving, get more fit, and have a ton of fun while you do so. Put another way, kickboxing is something you learn; cardio kickboxing is something you do. If you want to add some punches and kicks to your workout routine, or if you want to shed some pounds, cardio kickboxing may be the way to go. While kickboxing also offers a vigorous workout, the emphasis on technique may be more information than you're looking for. If you're interested in self-defense or learning how to fight, kickboxing is the more useful approach. Kickboxing classes will teach you how to throw punches and kicks correctly, which is essential to avoiding injury. Because cardio kickboxing emphasizes fitness, it's not a very useful tool for self-defense. At best, it will let you prove to yourself how hard you can kick and punch, and improve your confidence and coordination. These are skills that contribute to self-defense; nevertheless, you should not consider cardio kickboxing a self-defense skill. Ultimately, the main difference between cardio kickboxing and kickboxing is reflected in what your personal goals are. Both are exciting ways to get fit and stay motivated to move. Neither are boring, and both are solid ways to strengthen your body and your mind. Simply put, hitting stuff relieves stress!